While camping, backpacking or hiking in the countryside of your preference, it could happen that your clothes get wet either by the heavily sweating or after soaking in the rain. How to dry them as fast as possible in these unfortunate occurrences? Well, there are apparently many drying options and we will explore such techniques in here. Let’s say it rained on you while enjoying your outdoor activities, it will then be totally uncomfortable to even continue with your outdoor adventure with wet clothes. They can make you catch a cold or other illnesses. It is, therefore, a matter of utmost importance to know how to dry clothes fast in order to prevent the inconveniences of wet clothes on you. 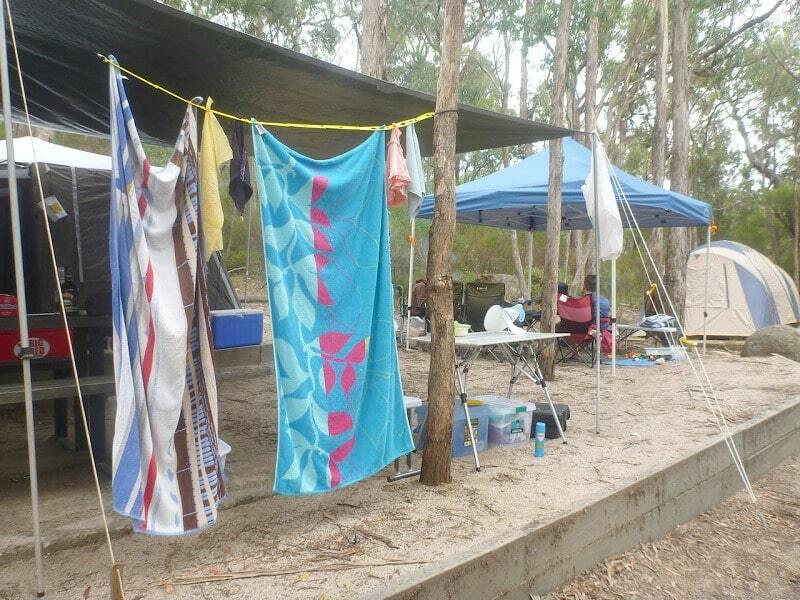 The another need to dry your clothes quickly is when you have washed some clothes in your camping site. It happens often that you overstay the anticipated excursion for days, so some of your clothes may be dirty. There are techniques allowing you to dry bundle of clothes fast even in camping rather than having to wait until you get home to use modern gadgets like hair dryers and cloth drying machines. However, drying in the wilderness depends on weather conditions only, because there is no modern equipment to use in drying your clothes. Backpackers, hikers, and campers often rely on heat, air pressure/flow and spinning in drying their garments. We will explore all these manual techniques in this article in a quest to make your outdoor fun hassle-free. Let’s start with the situation where you have soaked in rain or you have sweated heavily while hiking in hot temperatures. Travelers hate wearing heavy clothes, especially in hot temperatures. Presuming that you are wearing lighter clothes, it will be relatively ease to dry light, wet clothes fast, only if you are cognizant of the helpful techniques. In this instance, techniques to be employed are: To dry the clothes in the sun/wind, wrap the clothes with towels, put them in your sleeping bag or hang them on your backpack. After you have soaked in the rain, just go straight to your shelter or camping tent to put on the other pair of clothes while preparing to dry the wet ones faster in the sun. The problem may arise when there is no enough sunlight to dry the clothes or you got wet in the night. In the presence of enough hot sun, lay your clothes on rocks to dry quickly in contact with sun rays. Alternatively, you can put the clothes on your camping tent or on the camping chair to be in direct contact with the hot sun. You must, however, keep monitoring them so that you can fold them over repeatedly for the other sides to dry fast too. If you brought clothesline you can easily hang the clothes for the quick dry out. To set up this clothesline, use adjacent trees or attach it between the tent and the tree. Make sure you put the garments a distance apart to dry easily without distractions. The clothesline should be in direct with the sunlight not under the shadows of the trees because the clothes may not dry as quickly as you want. 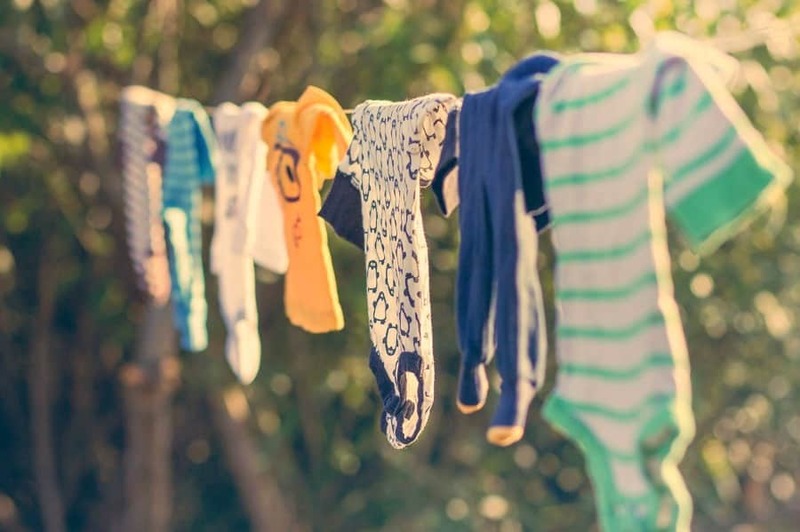 In cases where there is no enough hot sunlight, but strong winds, you can still leave the clothes on the clothesline or a drying rack the entire day or night. The wind is also powerful in drying out the moisture out of your clothes to dry faster. Even during the night, you can still continue drying out your wet clothes relying on the strong winds at night. 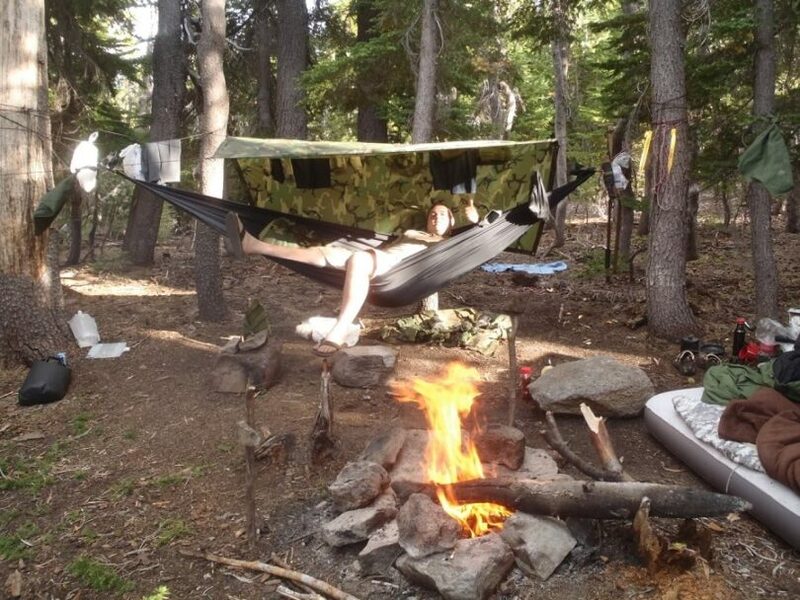 Alternatively, you can start a campfire, but a few feet from your camping tent to help dry your clothes. Hang your clothes on a tree next to the fire, but not too adjacent to avoid the possibility of your clothes burning. There are some synthetic fabrics that are very flammable so they can catch fire through the sparks of the camp fire. That being said, you must keep monitoring your clothes and keep folding them over for all sides to dry out before you probably wear the clothes the next morning. You are advised to keep touching the clothes to feel with your hand if they are not overheating due to strong flames of your wildfire. Before drying out your clothes in the sun or winds, make sure that you wring out excess water first. Failure to do so will lengthen the drying time. Squeeze the garments tightly to help them dry quickly. You can also spin them to help remove excess amounts of water. The same methods of drying your beloved clothes in the sun or winds can be accomplished in cases where you have sweated profusely. Sweat may not make the clothes too wet, unlike the heavy rainfalls. They should, therefore, dry out quickly compared to when you have soaked in the rain. In your camping gear, we assume that you brought extra blankets and towels for your warmth at night. The power of wrapping wet clothes in unused towels or blankets cannot be overlooked. Dry thick towels or blankets can easily absorb water from your wet clothes and make them dry quickly. 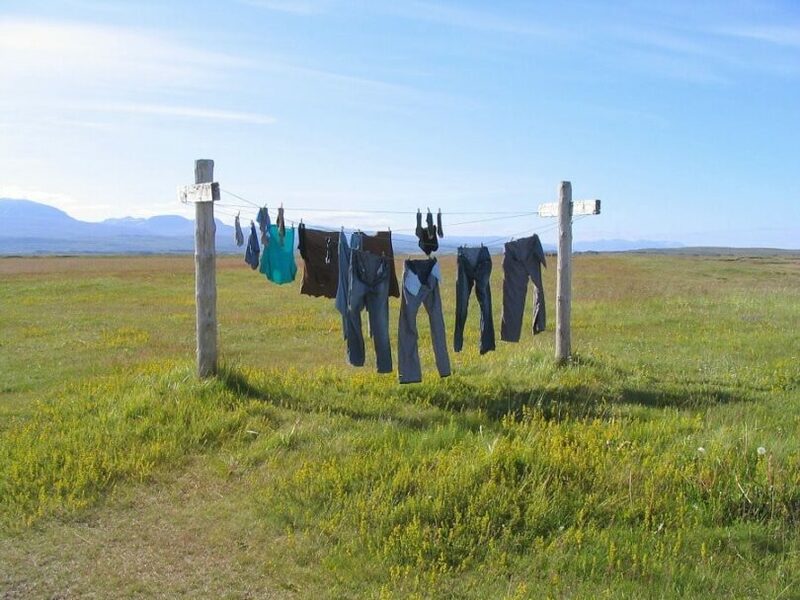 As a camper or hiker, you probably wouldn’t tolerate a long wait for your garments to dry in poor sun conditions. That could delay your purpose of walking around to explore the elegant amenities or mountains in the countryside. With the towels, you will not be disappointed. Here’s our list as specified in our article on the best backpacking towels you will need on your next trip. Simply take off your wet clothes and fold them in a towel. But squeeze as much water as possible before folding the clothes with the towel. This will help expedite the drying process and will help eliminate the need to use more towels successively. Then twist the towel and squeeze it to help expedite the absorption of water from your wet clothes. However, do not put many clothes at the same time, otherwise, the technique could be ineffective. 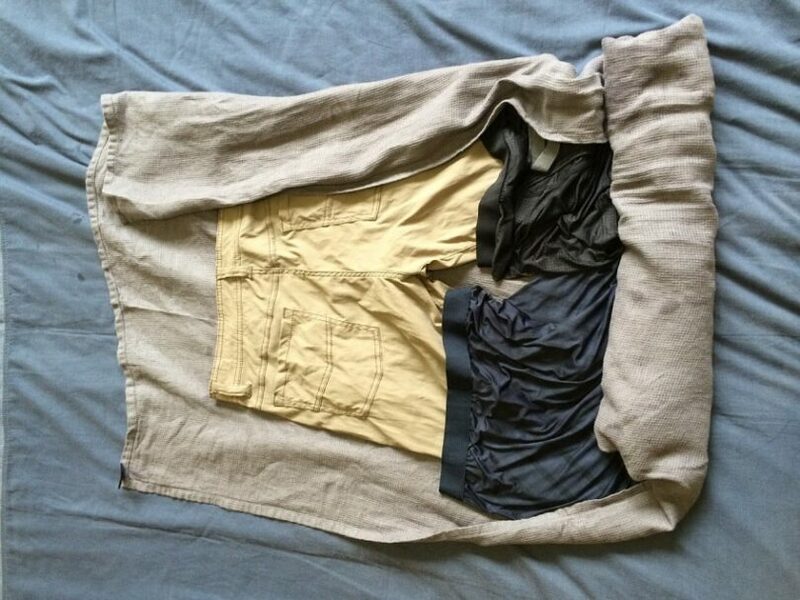 Fold maybe two clothes at once if you have worn more clothes. Repeated application is also preferable with more towels in case the garments have not dried up completely. But do not use the towels you sleep on during the night because then you will need to devise a plan on how to dry them as well before you could lay your head on them. The important thing to note with this technique is the material of the towel. Some have lint that could remain on your clothes after wrapping them. 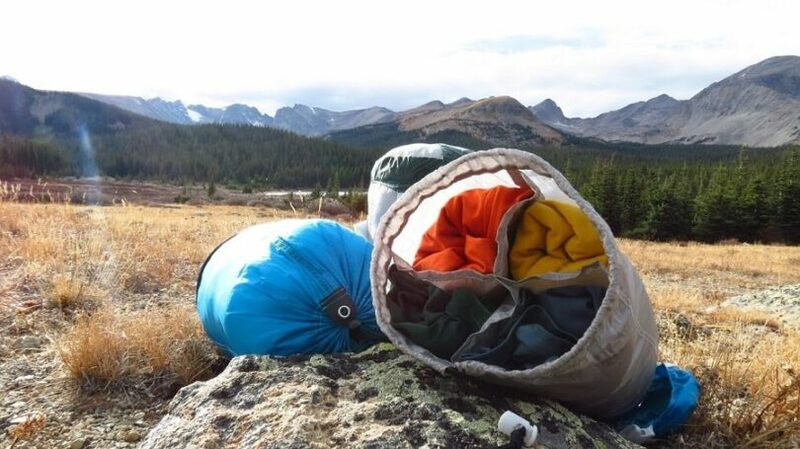 The sleeping bag also has the power to dry your clothes quickly. However, only slightly damp clothes are recommended depending on the material of your sleeping bag. Too wet clothes could make your sleeping bag too wet as well to inconvenience you when sleeping. The same applies to putting the clothes in the sleeping bag – you must wring out excess water using both hands. When you are sleeping on that bag at night, there will be some body heat to be used in drying out your damp clothes. If your clothes are too wet, expose them to enough ventilation before putting them in the sleeping bag. Also important is not to put many clothes at once otherwise the method could be rendered trivial or it could take too long to even dry out. Remember, you want a method that could dry your garments fast. Backpackers have extra clothes in their waterproof bags. In cases where you soaked in the rain while still enjoying backpacking in the wilderness, you can quickly dress in dry clothes and then hang the wet ones on your waterproof bag. As you proceed with your trip the sufficient airflow and the sunlight will take their course in drying out your lovely clothes. Only light clothes will dry quicker, more especially in the presence of a hot sun. Strong winds should also work just fine for this purpose. Even in cases where your clothes are wet due to sweating, this method still works effectively. Not only electric irons are dependable as in our homes unless you have purchased a portable and inexpensive solar panel that can power your electric iron. Then that could be an advantage to steam out the moisture from your clothes to let them dry quick at your campsite. After ironing, you can hang them for the final dry-ups of the sun or the winds. There are some alternative traditional irons than can be put on fire so that you can iron your clothes. These were used in olden days prior to the availability of electric irons. 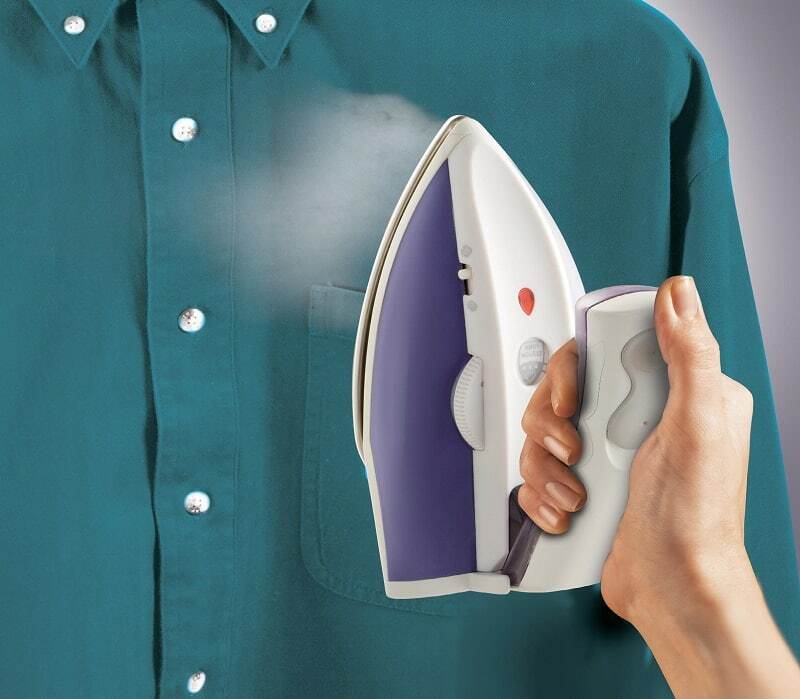 You can still rely on these irons to steam out the water from your wet clothes so that they dry rapidly. However, you should be vigilant when using these irons on your wet clothes to avoid any damage to the fabric. Do not put the iron directly on your cloth. Rather, place a towel wherein you can put the iron to dry the garment. That towel will help in absorbing water for quick dry off your clothes. Let’s now consider the situation whereby you wash your clothes in your camp and then expect them to dry faster. Washing a bundle of clothes may not be easy to let them dry as fast as when you’re drying few clothes soaked in rain. In this instance, you need to take cognizance of the favorable weather conditions. If a downpour is anticipated, then the mission of drying clothes faster, could not be accomplished. Almost the same techniques of drying clothes as we stated above can apply except putting many clothes in a sleeping bag or folding many clothes in a towel. Let us delve into a few viable quick dry clothing methods of a bundle of clothes. Whether hanging clothes during the day or night, it is important to squeeze excess water out of them to help them dry rapidly. 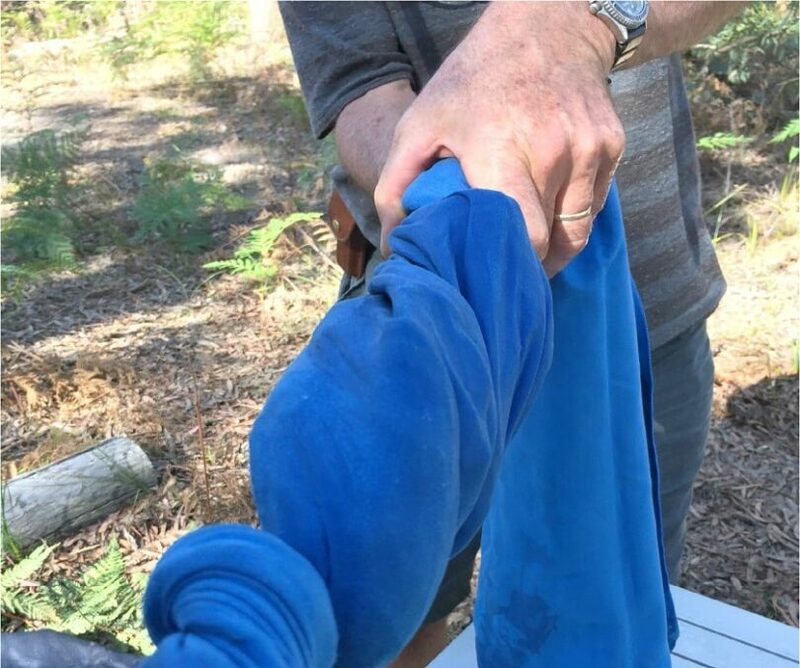 After washing the clothes, if at the campsite, wrench and wring them out. Use both your hands to tightly wring out a large amount of water directly to the ground, but far from your camping tent to avoid seepage of water into the tent. Otherwise squeeze the garments directly into the tub. After squeezing the clothes using both hands, you can use a dry towel to twist the clothes until excess water has been absorbed. Towels have proved to be more effective in drying slightly wet clothes by absorbing excess water. Well, this depends on the material of the towel. Often wool or cotton towels are preferable. If the clothes haven’t dried well you can repeat with extra dry towels. However, this process can be long if you washed many clothes because you will have to repeat using small bundles. We assume that you won’t take many clothes to camping even though it can be inescapable if the entire family went out with the kids. This method can, therefore, work well to dry your clothes faster. Immediately after wringing out excess water from your clothes you must put them on a clothesline or drying rack you brought. Otherwise, lay the clothes on the rocks in sunny conditions for them to dry quicker. Keep monitoring them to change sides so that either side gets enough sunlight evenly. In windy conditions, you can consider hanging the clothes on the trees for better airflow and air pressure that will help get rid of the moisture. While hanging your clothes, make sure you put them apart for a quick dry out. Light clothes will effectively dry faster in windy conditions than your jerseys or jeans. In the inconvenient instances where there is no sun at all or a promising strong wind, a campfire can be helpful. The fire can replace the hot sun rays It is not only in winter where sunlight is rare but also in some seasons. The fire can also help to dry out the clothes fast during the night. How to go about this technique? Firstly, you need to set up a fire pit wherein you can make a sufficient fire flame. But the fire should be made of natural materials because other fire accelerant substances such as gasoline or paraffin could transfer their odor onto your clothes. Procurement of proper materials is needed to execute this task of starting a campfire with organic materials. Be sure to read our article featuring techniques on fire building to be able to make a good fire. The chemical substances can adversely burn the clothes if used in creating fire when clothes are put too close. With this in mind, use only natural materials and hang your clothes in a comfortable distance where enough heat can dry the clothes faster. Keep feeling the heat with your hands on the clothes and then change the side of the clothes for even distribution of the heat. Traditional irons are also effective in drying out the clothes fast. These irons also need a campfire to use them. The safety tip to be noted is not to put the iron directly on the wet cloth. Also take note of the type of fabric to be ironed. It is safe to use a towel in ironing your wet clothes. This towel will also play a role in absorbing excess water. In your quest to dry clothes fast, you must employ only the viable methods for effective drying of your clothes. For example, you cannot use a sleeping bag to dry out a bundle of clothes irrespective of being heavy or light clothes. You must opt for other techniques such as a clothesline, squeezing the clothes or folding them in a towel and then twisting it. When using fire to dry garments, take into account all safety precautions of starting a campfire. Avoid creating fire too adjacent to the camping tent or other flammable materials that could destroy your outdoor great fun. Do not rely on chemicals to start a fire because their odor can affect your clothes which will then prompt you to wash them again. Before washing your clothes, check the weather forecast to avoid washing the clothes in imminent downpour conditions. It becomes relatively hard to dry clothes fast in rainy conditions even if you use ample ventilation in your tent. 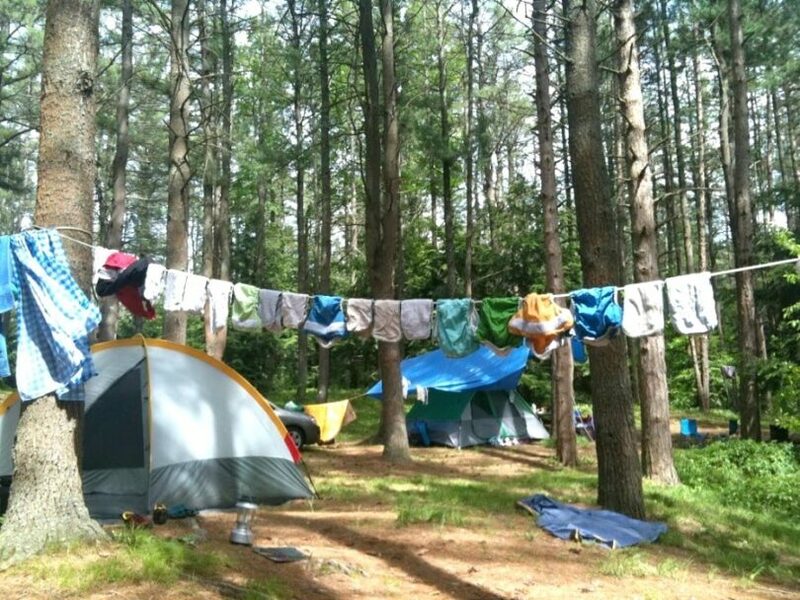 In case it rains after you have just washed your clothes, make a plan to hang them in your tent overnight. The camping tents often have rainfly and roof vents that could help in drying your clothes. See our piece on the top family tents that are durable and spacious, it’s a good read for you. In conclusion, the article has detailed out all the viable and feasible techniques of drying your clothes fast while camping, backpacking or hiking. You can try all the methods in your quest to shorten the drying time of your garments. Of utmost importance is to take note of safety measures, particularly when using fire to dry the clothes faster. Campfire could do more harm than good on your clothes, especially if it’s too close to the fire as well as the camping tent. For more safety tips when camping, see our article that deals with this important topic.